We've seen Jesus appear on the side of a coffee mug. Now it's the Madonna's turn  sort of. Made in Israel, this battery-operated "Icon of the Millennium, an unforgettable souvenir from the Holy Land" has a disturbing twist to it. By "touching the four crosses and forming the trinity sign (top-bottom-right-left)" a benediction plays while Mary is (and we quote) "gradually eliminated". Curious or what? 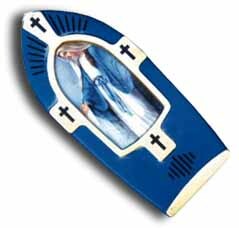 Oh, and if you order 10,000 units you can have your own, customised (and presumably disappearing) image to replace Mary.